A Significantly Improved Significance Test. Not! It is my great pleasure to share with you a breakthrough in statistical computing. There are many statistical tests: the t-test, the chi-squared test, the ANOVA, etc. I here present a new test, a test that answers the question researchers are most anxious to figure out, a test of significance, the significance test. 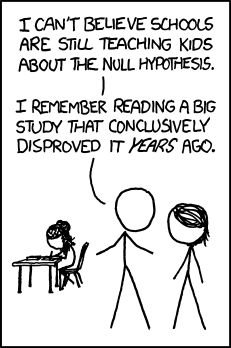 While a test like the two sample t-test tests the null hypothesis that the means of two populations are equal the significance test does not tiptoe around the canoe. It jumps right in, paddle in hand, and directly tests whether a result is significant or not. The significance test has been implemented in R as signif.test and is ready to be sourced and run. While other statistical procedures bombards you with useless information such as parameter estimates and confidence intervals signif.test only reports what truly matters, the one value, the p-vale. An interesting situation, that oh so many researchers have been battling with, is when a result is almost significant. Here signif.test uses the database compiled by Matthew Hankins to every time give a new example of how such a result could be presented in writing. Download signif.test from here or source it directly as above to see many more useful formulations. A current limitation of signif.test is that it compares at most two groups. If your data contains more groups you can compare them two at a time, surely some combination is going give a significant result! Sorry for being blunt, but it is true. p-values do not answer the question (dare I say most) people think/hope they do: “Is there a difference?” What is worse, the question most people think p-values answer (but they don’t) is not the right question to ask 95% of the time! In very few situations the interesting question is whether there is a difference, the interesting question is almost always: How large is the difference? What does p-values tell us about magnitudes? Zip! Dance of the p-values, a fun and quick video about some problems with p-values. The Cult of Statistical Significance: How the Standard Error Costs Us Jobs, Justice, and Lives. A book that forcefully criticizes “the sizeless stare of statistical significance” and argues for less p and more oomph in science. The arguments are also available in this shorter article. On John D. Cook’s blog: p-values are inconsistent and Five criticisms of significance testing.